In the movie Mr. 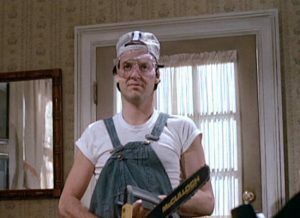 Mom, Jack (Michael Keaton) is fired from his job as an automobile engineer. Jack’s wife, Caroline (Teri Garr) lands a job before he can, so Jack takes on what he believes is the easy job of homemaker and caretaker. The movie has many humorous scenes. One particular scene Caroline’s boss comes to pick her up for a business trip. Jack does not want to come across as some helpless person so quickly gets in work clothes and comes into the house carrying a chainsaw. He asks the boss if he wants a beer, to which the boss replies, “it is 7:00 in the morning.” The conversation continues to be awkward as Jack remarks that he is doing a little remodeling. The boss asks Jack if he is going to be doing the electrical wiring and if he plans to use 220-volt wiring. Jack’s response, “Yeah 220, 221 whatever it takes” is classic. Jack’s reply discloses how little he understood about electrical requirements for a modern house in the United States. Very few appliances actually use 220-volt electricity, but nothing – and I repeat, nothing – uses 221 volts. A simple 1-volt difference makes a huge difference. So it is also with money – small things can make a huge difference. That was the case with some recent clients, Jane and John Jones. As always, during our first visit with Jane and John, we collected as much financial information about them as we could using our fact-finding worksheet. The two of them had been married for a few years and were in their mid 20’s. Jane’s parents had been using a whole life insurance policy as a place to save for Jane’s future since she was a small child and had gifted the policy to her after the wedding. John was certain the policy was a big rip off based on what he had heard from radio and TV personalities. He wants to cancel the policy. Jane did not, and of course, neither did her parents; they insisted John come in to meet with us. One of the pieces of information we gathered was that John came into the marriage with “about $20,000” in credit card debt. The minimum payment on this $20,000 debt was $370 per month. That payment every month was simply killing them. In fact, one of the first things John said when we talked was, “We have $20,000 in credit card debt and we must get rid of it.” His solution was surrendering the policy and using the cash to pay off the debt. For the purposes of this article, I am not going to spend much time on the fate of the policy but will simply illustrate why accurate numbers and clear understanding of money can make all the difference in the world – in other words, why knowing the whole truth is important. The credit card company was charging the Jones 22% interest on their debt. When we plug the numbers into one our Truth Concepts calculators (see below), we see it will take about 260 months to pay off the debt. That is 21 years and 8 months with a $370 per month payment if they didn’t make any additional charges. 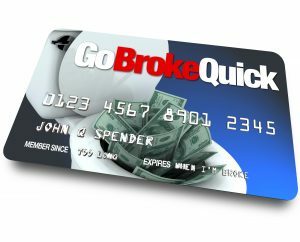 Don’t be surprised by this enormously long time period to pay for credit card debt when paying the minimum amount. Most people do not understand it, but thanks to the laws of the land, the credit card companies are required to print on every statement how long it will take to pay off the debt if a person only pays the minimum amount. We have worked with a lot of people and because of the Truth Concept software, we knew having accurate numbers, ie: the whole truth, was very important. Notice how a measly $155 in additional debt causes the number of months required to pay off that debt to jump roughly 105 months! Those numbers mean that $370/month x 105 additional months = $38,850 more John and Jane end up paying for their debt. That is no small amount of money, in fact, I would say it’s staggering. When we showed the two love birds this difference we certainly got their attention. When it comes to money, financing, saving, and investing, understanding the whole truth about a situation can make a world of difference. You should work with competent people who work to educate and empower you to make better financial decisions. Todd, do you have examples of how to use the calculators to teach clients how to use there Dividend-Paying W.L. 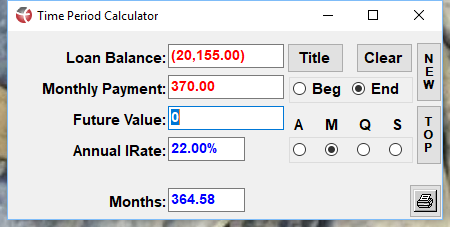 to manage and pay off debt? We own the software and love it. Thank you, Mike! 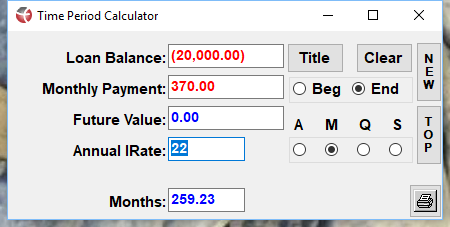 The Borrowing Strategies calculator combined with the Loan Analysis calculator will do that.